At midnight a thunderous storm blew heavy rain against the window panes. After a 92°F. day, normal for mid-August, the air was still quite warm as I opened the front door to peer at the downpour. In the early morning light the garden stood refreshed. Facing west, light enters the garden first from the north through a break between our house and the neighbors’. The garden is more filled out and more lush and green for this time of year. I enjoy noticing the abstractness of the garden layout from above. This entry was posted in garden and tagged almanac, garden almanac, late summer garden, meditation circle, meditation garden, meditation path on August 13, 2013 by pbmgarden. I enjoy seeing the garden from these high view points. glad your temperatures are improving, here it remains hot. So glad you are going to have some respite from the heat, I’m sure your garden is too! Lovely shots of your garden, I imagine it was very grateful of your overnight rain. Thanks Pauline. Yes the rains are welcome. Even though we’ve had a good amount of rain, the hot days really stress the plants so they needed a drink. Thank you! You deserved the sleep after all your busy projects. The storm woke me, then I couldn’t get back to sleep. Your meditation circle really is looking lovely this summer. I love that kind of light in the mornings after rain too. Enjoy your cooler spell. It’s cooler here and I was able to work outside quite comfortably today. 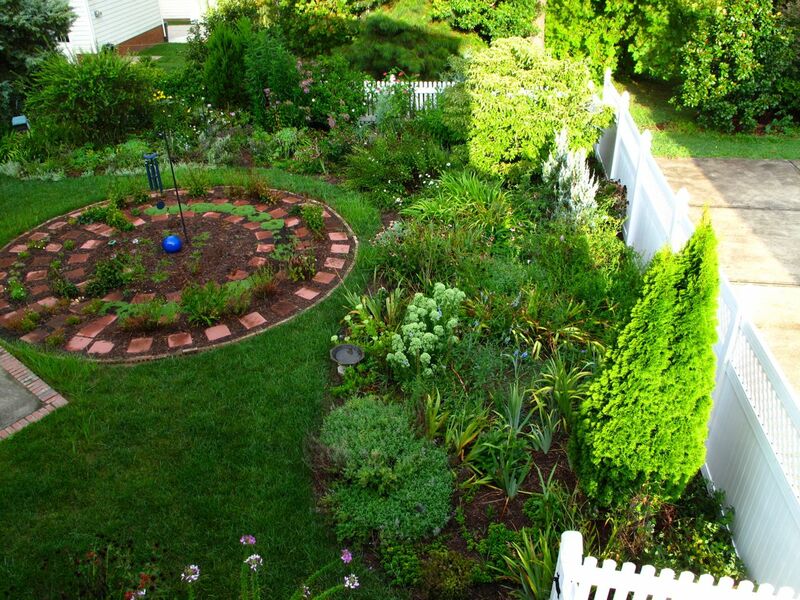 It looks very interesting from above, Susie, and isn’t it amazing how lush and green your garden is! I once made a thyme circle once and after a splendid couple of years the thyme gradually disappeared. May need to be replaced from time to time. I just opted for other plants. Thanks Annette. YOur thyme circle sounds nice! 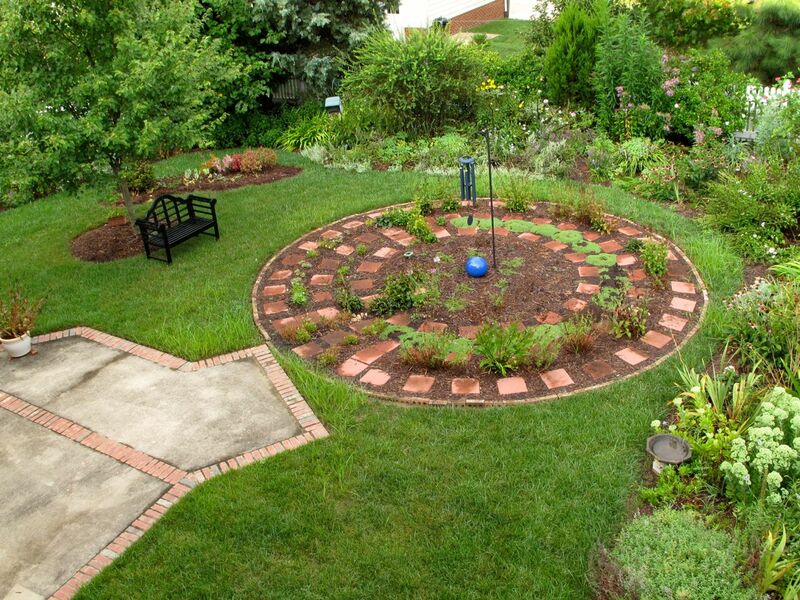 My goal was to use evergreens such as the thyme in the circle that would bloom to provide occasional color. I was hoping to avoid replacing the plants but my experiments haven’t achieved my dream. Many died last year and I tried a few different ones this year. Will have to give it more attention and thought. This is very nice. I had no idea that you could look down on it. It’s like being up in a tree house, hanging your feet off and checking out the surrounding area. 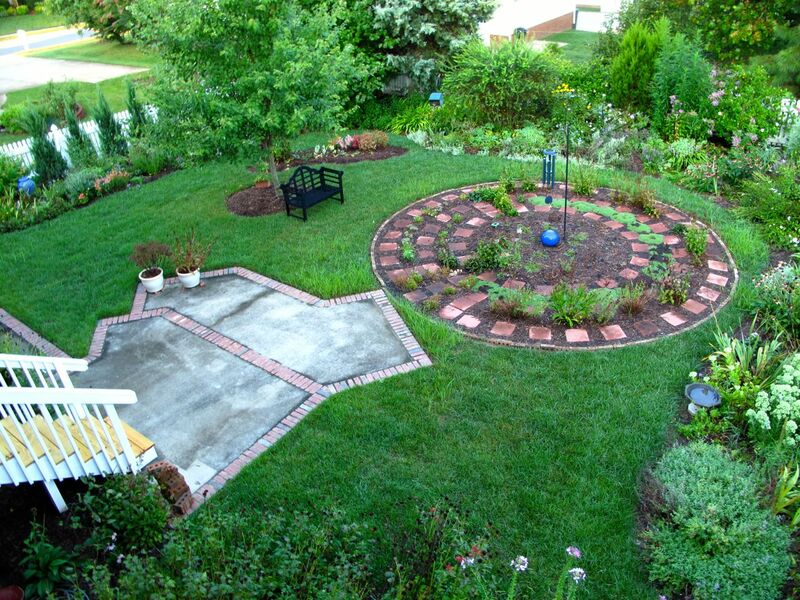 I really like the design of your back yard with the circular garden in the center and the borders all around. Thanks very much. The borders were planned originally when we moved in with a bare landscape. The mediation circle was added a couple of years ago and I really like that feature. It’s made a real focal point that the garden was lacking. Judy, sometimes the answers come, other time, not. But it is a peaceful spot. 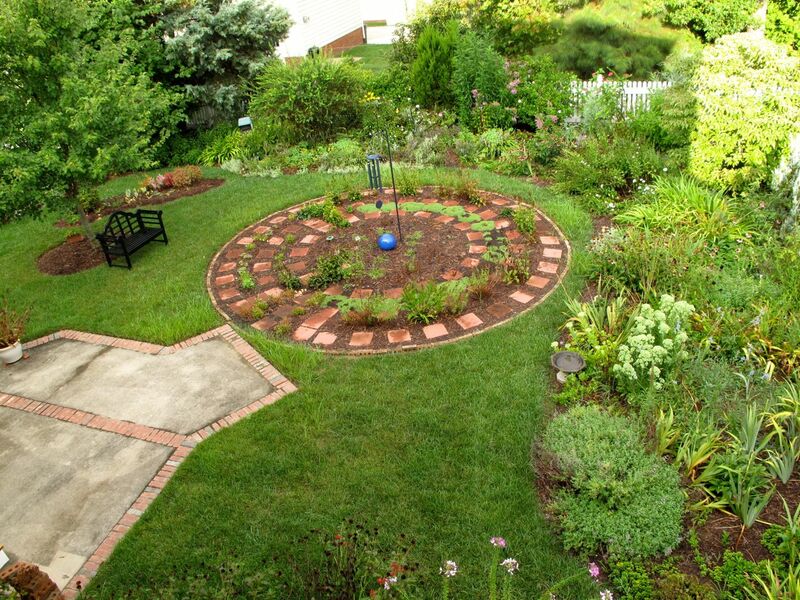 I love the view from above especially the Meditation Circle…..such a peaceful sight surrounded by the lovely gardens. I find it a treat to be able to view the garden from this view. 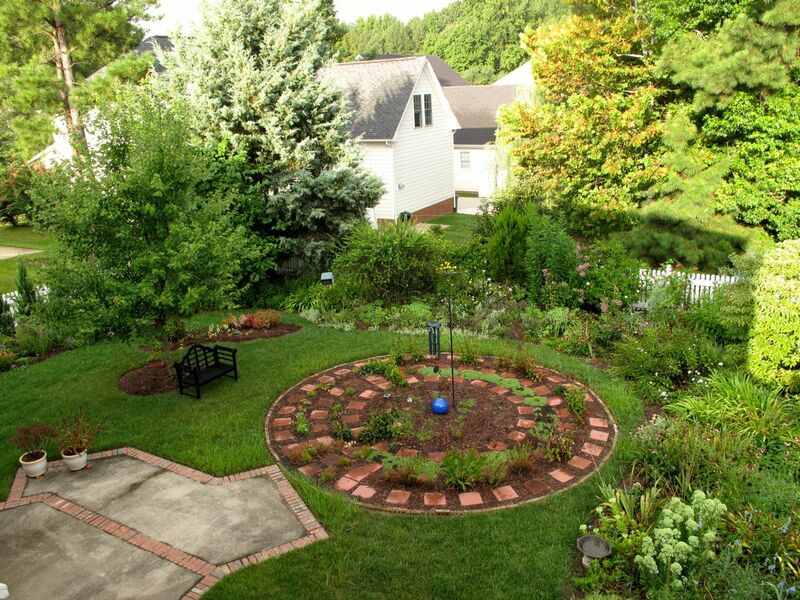 One of my goals when I set out to renovate my garden was to create a peaceful setting. There’s always more to do but I am happy with the results. For me it’s calming to look down at the garden or to be in it. Have a great day.